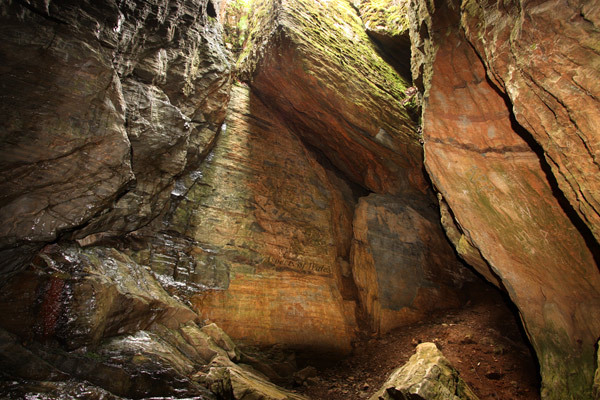 This cave is believed to be the hideout of Twm Sion Cati, a legendary figure in Welsh history. Sometimes referred to as the Welsh Robin Hood, his real name was Thomas Jones and he lived from around 1530 to 1609. Hundreds of peoples' names are carved into the walls of the cave. This photo was taken in July 2011 at NGR SS7804546836, in the Dinas RSPB Nature Reserve. Canon EOS 40D, Canon EF-S 10-22mm lens at 11mm, manfrotto tripod. Exposure F8 at 1.3 secs with flash. Original image in Raw format.